Your wedding band should be an extension of your personality. Put your passion on full display with a sports wedding ring from Titanium-Buzz that's perfect for the dedicated sports fan or a leisure athlete. Shop designs representing baseball, basketball, hockey, and golf. Our sports-inspired rings are the perfect way to celebrate your sporty side and show off your love of the game at the same time. Whether you're a diehard baller or love a round on the greens, you'll find a sweet sports ring in our selection to pay tribute to your preferred pastime. Maybe we're biased, but we think these one-of-a-kind styles make the coolest men's wedding bands, and they ain't a bad pick for the sports-loving lady either! She'll consider you the greatest of all time when you gift her one of our sports-themed wedding bands or engagement rings. Trust us. 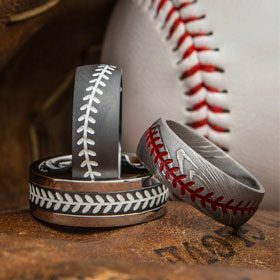 Whether you're looking for a baseball wedding ring, basketball rings, or another type of sports ring, Titanium-Buzz has you covered. Our impressive selection will make you the MVP of your wedding day. We carry multiple designs to honor a wide variety of sports to give you plenty of options to choose from. Simply pick your favorite style, select your size and we'll send your sports wedding band right to your door. Our sports wedding rings can be engraved with up to 30 characters of text to ensure that it becomes a lifelong keepsake that'll always remind you of your special kind of romance. So go ahead and add some initials or a special date to the inside of your wedding band. 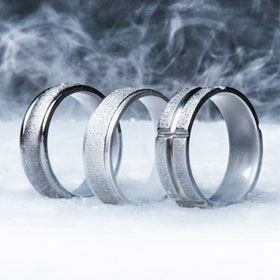 Our selection of cool men's wedding bands includes the perfect motif to celebrate your particular passion. Swing for the fences with one of our truly unique baseball rings, featuring a detailed stitch design inspired by the ball, or choose one of our stylish basketball rings finished with the markings of a basketball. We've got the perfect all-American baseball wedding band, hockey band, football band, or golf band to get you in the sporty spirit. Whether you're a devoted linksman or a rising soccer star, Titanium-Buzz offers the perfect style for you. Looking for something for the lady? In addition to baseball wedding bands for men, we also have unisex softball wedding bands for the diehard baller. You'll get serious points with your sports-loving lady when you get down on one knee and debut our Cobalt Diamond Baseball Engagement Ring. This cool style features a cobalt chrome band with a baseball stitch design. The cherry on top is the central diamond that positively sparkles. Plus, we offer sporty rings for guys and gals alike who can't pick just one sport. Check out one of our amazing titanium triathlon rings, a perfect pick for the athlete who loves to swim, cycle, and run. Oh, and if that's not enough for you, check out our awesome collection of men's hockey rings in styles that honor the most devoted pucksmen. In short, if you can play it, Titanium-buzz has a ring to celebrate it! 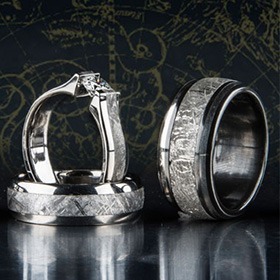 Our sport rings are priced affordably and fit comfortably into any wedding budget. 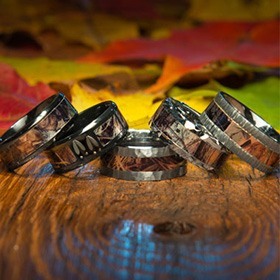 All of these cool men's wedding rings and ladies' rings are proudly made in the U.S. for superior quality. We also offer free U.S. shipping on every qualifying order. Have an idea for a design? Love a sport that you don't see represented? We can help you out! We are lightyears beyond your average jewelry store, so even as our collection grows we gladly take on custom products as well. Give us a call at 1-866-215-1861 or send us an email with your questions and ideas. You'll be amazed at what we can do for you. Explore all available styles of wedding bands for men to find the most impressive ones.